7 May 2010 - In signing the OECD Convention, Chile pledged its full dedication to achieving the Organisation’s fundamental aims. Chile is the first South American country to join the OECD. Pictured (from left to right): Jaime Chomali, Economic Advisor at the Embassy of Chile in France, Rodrigo Álvarez, Under-Secretary of the Chilean Finance Ministry, Fernando Schmidt, Under-Secretary of the Chilean Ministry of Foreign Affairs, Ambassador Roger Karoutchi, Permanent Representative of France to the OECD, Elisabeth Béton-Delègue, Director for the Americas and the Caribbean at the French Ministry of Foreign Affairs and Patricio Utreras, Acting Representative of Chile to the OECD. 11 January 2010 - An Accession Agreement was signed at the Palacio de La Moneda in Santiago, Chile. This agreement defined the obligations of OECD membership and included Chile's specific remarks on acceptance of OECD legal instruments. Pictured: President of Chile Michelle Bachelet with the Agreement. To her right is OECD Secretary-General Angel Gurría, and to her left is Minister of Finance Andrés Velasco. 15 December 2009 - The OECD issued an invitation to Chile to become a member of the OECD. The invitation resulted from the OECD Council's positive assessment of Chile’s position with respect to OECD instruments, standards and benchmarks. 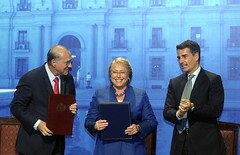 Pictured (from left to right): Pilar Armanet, Chilean Ambassador to France, Andrés Velasco, Chilean Finance Minister, and Angel Gurría, OECD Secretary-General, during the ceremony. 28 May 2009 - Chile signed an Agreement on the Privileges and Immunities of the Organisation. The purpose of this agreement is to enable the Organisation to fully and efficiently discharge its responsibilities. 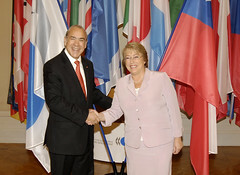 Pictured: Chilean President Michelle Bachelet with OECD Secretary-General Angel Gurría after the signature ceremony. 2007-2009 - 20 OECD committees reviewed Chile's policies. These reviews assessed the country’s position on OECD legal instruments and the degree of coherence of policies with those of OECD member countries, in what amounts to a sort of 360 degree in-depth review of the candidate country. 30 November 2007 - The OECD Council approved the 'roadmaps to accession of Chile to the OECD Convention. An accession roadmap sets out the terms, conditions and process for OECD accession. Pictured: Pilar Armanet, Chilean Ambassador to France receives the roadmap from OECD Secretary-General Angel Gurría. 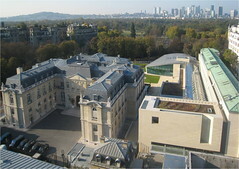 16 May 2007 - The OECD Council at Ministerial level adopted a resolution to open discussions with Chile for its membership of the Organisation, along with Estonia, Israel, the Russian Federation and Slovenia. >> Consult the background note on Chile's accession to the OECD for further information.